Should Medical Marijuana in Florida Block Gun Ownership Rights? Recently the big election season of 2016 came to a close. Not only do we have a new president, but also a few new states with big marijuana reforms. Florida is among the states to turn the tide and legalize medical marijuana, with specific restrictions of course. But one restriction that could be imposed most people probably don’t know about with medical marijuana is one on gun-ownership. So when taking a look at what some U.S. courts have ruled in the past, should medical marijuana block your gun ownership rights? How could this impact medical marijuana in Florida? The case of S. Rowan Wilson, a Nevada resident, is what recently brought this subject to light. In 2011 Wilson attempted to purchase a handgun but was denied when the gun store owner recognized her as a medical marijuana cardholder. She insisted that she only obtained the card as a political statement in solidarity with legalization. In court Wilson maintained that she does not herself use marijuana. So how will it play out now that there is medical marijuana in Florida? This makes sense, since even though many states are legalizing marijuana for medical or recreational use, marijuana remains illegal for any purpose under federal law. So medical marijuana in Florida is subject to the same idea of federal regulation. The 4th Circuit argues that the question of correlation vs. causation doesn’t matter. They insist it was not the government’s responsibility to prove a causal link between drug use and violence. Simply put, they didn’t need to prove if drug use causes violence or if violence causes the drug use. To ban someone from owning a gun all they need is to make any connection. Which, when you think about it, seems almost lazy. 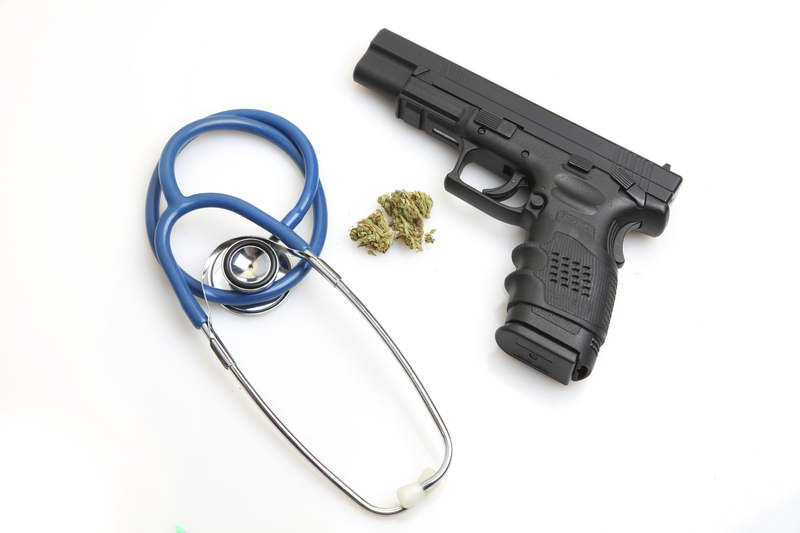 So what we want to ask is- should using medical marijuana keep you from owning a gun? Essentially the courts say that anyone who uses medical marijuana or any substance has an increased chance of risk behavior. They say that if someone has a medical marijuana card, basically they are too dangerous to allow a firearm. But given this logic, it should apply to every substance. There are plenty of other drugs that technically fit the bill, and not just illegal ones. The truth is, alcohol is probably one of the most dangerous drugs in the world, yet because it is “socially acceptable” it is not under nearly as much restriction. So if we are going to consider medical marijuana in Florida as means to restrict our 2nd Amendment, shouldn’t we see it the same for alcohol, or even other prescription medications? We have said it time and time again- a drug is a drug. If we truly believe any substance, legal or not, that can be abuse is equally dangerous in terms of addiction and risk behavior than should we treat them equally? Should we restrict the right to own a gun for anyone who uses anything? Does medical marijuana make someone too dangerous to own a gun? Or is this discrimination? Overall, the issue of marijuana reform is an increasingly complex issue and in the future, solutions to the problems of legalization will be addressed. But for those who struggle with addiction marijuana can still be a dangerous substance. If you or someone you love is struggling with substance abuse or addiction, please call toll-free now. We want to help.